The Archers of Loaf first album, Icky Mettle, was one of a seemingly endless supply of skewed US indie-rock records that were predominant in the mid 90s (a genre that was so prevalent that it was even made into the theme of one of Sebadoh’s more ironic songs). And it suffered for it…at least, as far as I was concerned. Angrier and less arch than Pavement, lacking Guided by Voices’ obtuseness, poppier than Thinking Fellers and Truman’s Water; Archers of Loaf were a kaleidoscope of colour in comparison to Girls vs Boys or Fugazi. Yet it was easy at the time to think that they were just another American band nestling amid the ‘Lo-Fi’ section of your local vinyl outlet. 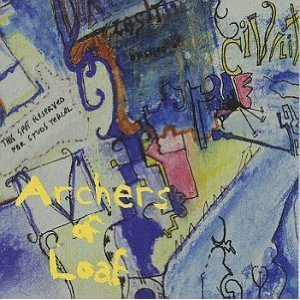 But in contrast to some of their more willful contemporaries, time has been kind to The Archers and the band’s (relatively) straightforward approach to song-writing has, to my mind, worn better than many of those more tricksy recording artists operating at that time. Listening back all these years on, it is obvious that what at first seems like a set of noisy but basically catchy little pop songs actually masks something much more slippery and complex – like so many of the very best records, there is more to Icky Mettle than meets the eye. So it draws you in, ensnares you and then that heady combination of great hooks, shoutalong choruses and dark, furious subject matter guarantees a prolonged and fulfilling relationship. Icky Mettle gives up its secrets piece by piece, and has somehow morphed with the times to remain as relevant and vital today as it ever was, perhaps even more so as so many of its mid 90s rivals have fallen by the wayside; the lack of true inspiration in the chaff from this era becoming ever more obvious with the passing of time and the re-aligning of perception. Icky Mettle’s currency is relationships gone bad, but the playful, catchy songs mean these anthems to lost love are cathartic, not mopey, and there’s never any doubting who’s coming out on top – after all, if you can work it out of your system by screaming at a room full of sweaty youths whilst pummeling your instruments and hammering home your points, it’s got to help, hasn’t it? Icky Mettle sets it stall out in its very first line – a killer first line in a killer first song that has gone on to become The Archers of Loaf’s anthem. Simply put, Web in Front is awesome. And that line, ‘Stuck a pin in your backbone’ is surely etched in the minds of anyone who ever went to an indie disco in 1994. What a bizarre, beguiling and original combination of words. From the off it’s obvious that this is not a pale facsimile, a cynical bunch of bandwagon jumpers (not that, in monetary terms at least, this was a bandwagon worth jumping on!). No, Icky Mettle is an album made by the inspired, articulate and intelligent minds of Chapel Hill residents Eric Bachmann, Eric Johnson, Matt Gentling and Mark Price. And it’s played with raucous conviction – messy and unconcerned with dotting ‘i’s and crossing ‘t’s but thrillingly real and human throughout its brisk 38 minutes. 38 minutes that can so easily turn into 76, 114, 152… minutes as the addictive qualities of Icky Mettle begin to weave their magic on your heart, bones and synapses! Rob listened: For reasons Tom has eloquently detailed, I was immersed, or perhaps flailing around, in the depths of this stuff in the first half of the 90s. For some time I would buy records, often seven inches, on the basis of a half-remembered Peel namecheck or even some half-sensed association with some other artist, perhaps based on the cover art or even the name. I certainly never remember hearing Web In Front at an indie disco, so I suspect it was one of these random routes which led me to it (and possible a poorly divined name-connection which then took me on to Wingtip Sloat (anyone?) and, in that case, no further). I’ve been hooked since day one. It’s a great record with all the qualities Tom outlines. I had the pleasure of reviewing their follow-up ‘Vee Vee’ and it’s more polished and straightforwardly rock but even so the strength of the songwriting is undeniable. Clearly the Archers had something forceful going for them even if they never garnered the recognition they deserved.